Tony Robbins' newest book reveals the asset allocation of Ray Dalio's All-Weather Fund. The allocation is designed to balance the percentage of risk rather than the percentage of money to each asset. This strategy can be replicated using low-cost ETFs, but the biggest challenge is in sticking with the allocation as the years go by and each asset performs differently. Everyone in the business knows Ray Dalio is the manager of the world's largest hedge fund, but his portfolio strategy has not always been very accessible by the public. Dalio has not added any clients in ten years, and even then, the only way to get access to the fund was with a net worth of at least four billion dollars and a minimum investment of 100 million dollars. Luckily, when Tony Robbins sat down with Dalio to interview him for his latest book, Ray shared the specifics of how he allocates the All-Weather fund. So this article will look at how to replicate that portfolio using a series of low-cost ETFs. Keep in mind that the fund does use leverage to increase the returns, and this allocation does not include any of the hedging activities. The large percentage allocated to bonds is a surprise to most, but the reasoning behind it is based on balancing the percentage of risk rather than the percentage of money put into each asset. Stocks are three times more volatile than bonds, so putting a higher percentage into bonds balances the risk in a way that putting 50/50 stocks and bonds wouldn't. 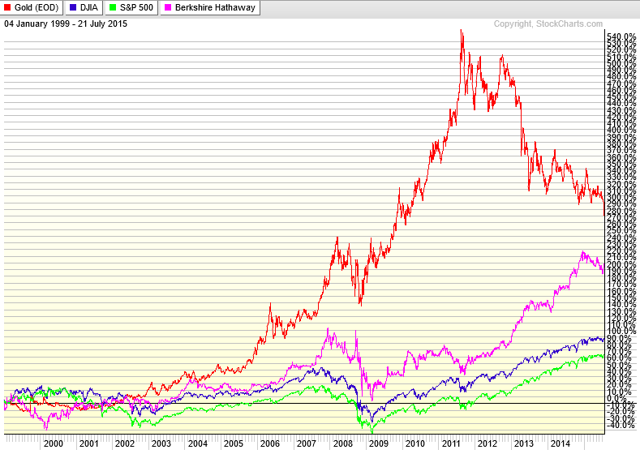 So the 15% in gold and commodities works the same way, as these are more volatile than both stocks and bonds. This approach is not all that different from Harry Browne's permanent portfolio concept, which is a little more simple with 25% stocks, 25% bonds, 25% cash, and 25% gold. Swiss investor Marc Faber also recommends a similar allocation, 25% stocks, 25% bonds/fixed income, 25% real estate, and 25% gold. Dr. Faber's portfolio is more suited towards very wealthy individuals, and it is closer to the "one third, one third, one third" concept that Jim Rickards talks about in regards to how wealthy families keep their wealth intact over many generations. The allocation is one third in land, one third in gold, and one third in fine art. This particular strategy takes a VERY long-term point of view and looks to protect and preserve wealth against any and all crises from depressions, wars, to hyperinflation. 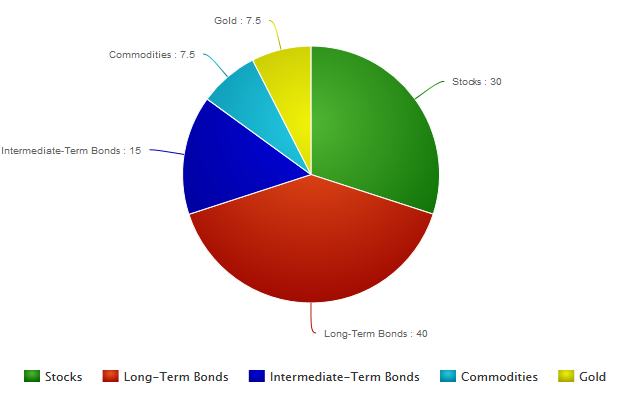 Dalio's All-Weather fund is not centered around hedging against inflation/hyperinflation as much as the portfolios mentioned above, but the 15% in gold and commodities shows that he does have some concerns about inflation even though he might not think severe inflation is inevitable and imminent. In fact, it was the historic event in 1971 of President Nixon taking the US off the gold standard for good that greatly shaped Ray's "all weather" strategy and realization that no one can really predict which investments will do best in the future. With assets totaling 1.2 billion dollars, this fund invests in both government and investment-grade corporate long-term bonds. The mix of corporate bonds helps to give the yield a boost that one would not get by going only with government bonds. Of course, when you go with any Vanguard ETF, you are usually getting the lowest expense ratio in the industry, and with this particular ETF, the ER is only .10%. The yield is 4.05%. This popular fund is even bigger with total assets of 5.95 billion dollars. There are not too many differences between this fund and BLV, except that this fund of course holds only shorter-term bonds. The yield is 2.73%, and the expense ratio is also a very low .10%. For this 15% portion, you could also split it into two, with BIV on one side and a TIPS ETF on the other. Only 30% in stocks seems very low compared to conventional wisdom. Again though, Dalio's strategy puts the assets with the most volatility as a lower percentage of the portfolio. VOO is a large fund with 34.41 billion in assets. The expense ratio is .05%, which is very important for the long-term investor and the highlight of this ETF. The yield for VOO is 2.01%. In some of my recent articles, I have been highlighting ETFs that can provide income that would be cushioned from a major crash in the US, which I anticipate, although I won't put a time on it. So, in that vein, I would add to this by splitting the equities portion of this strategy into two parts; one, domestic equities, and the other, international equities. For the international exposure, I think the Vanguard FTSE All-World Ex-US ETF (NYSEARCA:VEU) is the best choice within this strategy. This ETF has 14.82 billion in assets, an expense ratio of .14%, and the yield is 2.81%. 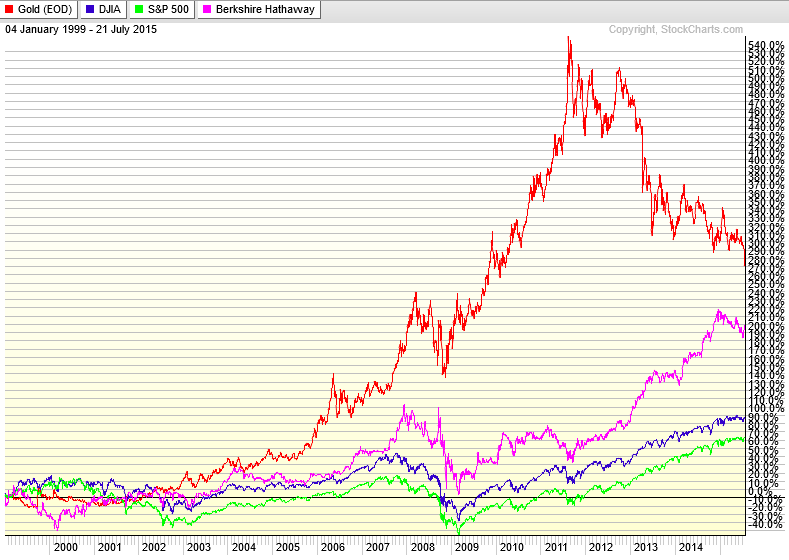 This allocation to gold and commodities again goes against conventional wisdom. Considering the most recent downturn in gold, it would be even more difficult for most people to consider gold and commodities in their portfolio. It is easily the most hated commodity in world today, or at least it is the most hated in the financial mainstream media. Gold and the whole natural resource sector have been in a deflation since 2011, but that does not change the fact that since the late 90s, gold has outperformed the Dow, the S&P 500, as well as Berkshire Hathaway (NYSE:BRK.A) (NYSE:BRK.B). So, for this portion of the portfolio, IAU works best for the gold portion, because it has the lowest expense ratio of any gold ETF at .25%, as well as plenty of liquidity. For the commodities, DBC is a good choice. It tracks the DBIQ Optimum Yield Diversified Commodity Index Excess Return™ which has exposure to 14 of the most heavily traded commodities. While the expense ratio is higher than I would like at .85%, the fund offers exposure to the futures market without going through the actual trading process yourself. SA contributor Dan Bortolotti points out that this allocation did not provide mind-blowing returns over the past three decades (9.7% annualized returns) and that most people could not stomach any one asset going through turmoil while another asset is rising. The problem lies in the emotions of individual investors though, not in the actual portfolio. However you slice it up, it is going to be very difficult for most people to sit by while any part of their portfolio is not performing very well. The natural instinct is to sell the portion that is underperforming and be overweight the portion that is doing good. How many of the people who were 90% stocks and 10% bonds stuck with that strategy in 2008 when the crisis was going on? What about putting all your eggs in one basket, would that not cause tremendous pain when that one asset inevitably goes through a bear market? All that most people will need is basic asset allocation of their assets and the ability to stick with the allocation over a period of decades. Even for the person who is not a financial expert, the better option is to keep a core portfolio of low-cost and commission-free ETFs instead of letting a mutual fund do the same thing but with extra fees attached.